Pentecost is a two-day public holiday in Hungary: Sunday 09. June and Monday 10. June 2019. It is a Christian holiday held on the 50th day after Easter. Many traditions and folk customs relate to the day that are kept alive on Pentecost festivals. Although shops, markets, banks etc. will be closed, a couple of great festivals and programs await visitors in Budapest over the weekend. 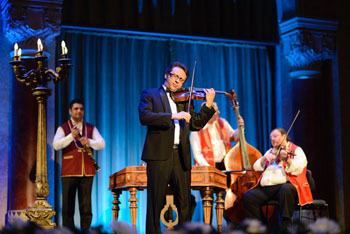 The historic Castle Bazaar and Gardens on the river bank in Buda host a Folk Art Festival showcasing traditions and games related to Pentecost. Playhouse and workshops await visitors with fun activities on Ybl Miklós Square and in the neo-Renaissance Garden. Giant wood swings by the Hellowood team will adorn the square, where local bands give concerts in the evening. Come and join the Pentecost Gathering on two of the most impressive terraces of the Royal Castle in Buda! local food and drinks (craft beer, wines, non-alcoholic beverages). A unique attraction is the flowering Tree of Life and the ancient ritual of the Pentecost Queen procession. The festival looks back to 13 years of tradition welcoming families and everyone with rich cultural and children programs. 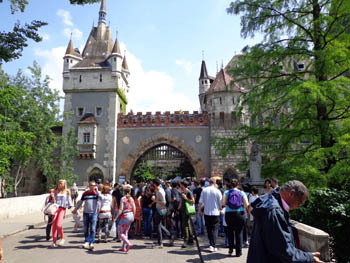 Hungarian castles demonstrate their program offer in front of Vajdahunyad Castle with weapon and costume show. A whole day festival with family and children programs in a lovely green neighbourhood of the Buda side, near Gellért Hill. 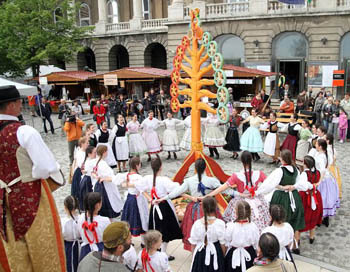 13:55 – Folk dance show and dance house I. 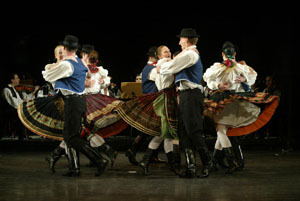 16:05 – Folk dance show and dance house II. The biggest foodie event of the city, the Gourmet Festival will be held over the Pentecost weekend. the excellent wines, craft beers and other drinks. Show cooking, international chef stars, children activities ensure great fun! Combine Stand Up Paddling and yoga and let the beach atmoshpere at Lupa Lake completely unwind you! 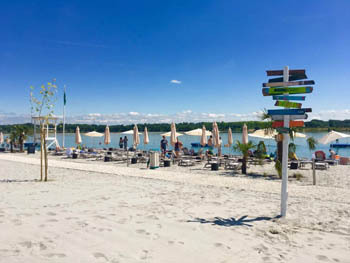 The lake with two exquisite sandy beaches is north of Budapest in Budakalász. Please bring light clothes that you don’t mind if it gets wet (yoga or bathing suit)! Location: Nánási út 47-49., Budapest, 1031, district III. 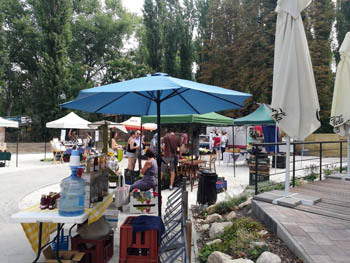 Visit the Róma-parti Piac farmers’ market right on the bank of the Danube in Óbuda district, held on Saturdays. cheese and sausages from local, small producers. An amazing concert and dance show providing a glipmpse into Hungary’s verstaile cultural heritage in 90 minutes.. Some museums will be open on Pentecost Monday – Budapest museums are usually closed on Mondays – others will be closed. Please visit the webpage of individual museums for up-to-date information. The National Gallery in Buda’s Royal Palace will be open on 20 – 21. May between 10.00 – 18.00. Address: Múzeum krt. 14-16., district VIII. The museum will be open on Pentecost Sunday, 20. May between 10.00 – 18.00, but remains closed on 21. May, Monday. 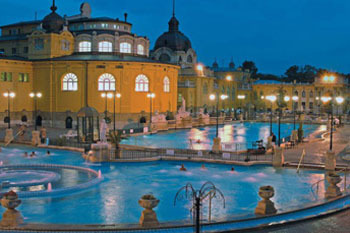 It has an extensive exhibit on the history of Hungary. The most precious treasure you cna view is the coronation mantel of King St. Stephen. Note: The Great Synagogue in Dohány Str. and the Jewish museum will be closed on 09 – 10. June 2019. The Veli Bej Bath is closed on public holidays so it won1t be open on 20. May and 21. May. 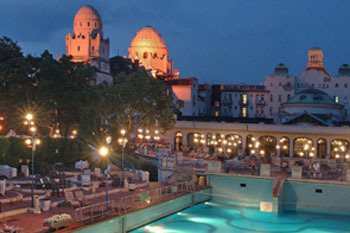 Some of the outdoor pools – Palatinus – are also welcome visitors over the Pentecost weekend. On 19. May/Saturday metro, tram bus and other public transportation will run according to Saturday schedule, on 20 – 21. May (Whitsun and Whit Monday) according to Sunday-holiday schedule. The M2 and M4 metro lines will operate till 01.00 am on Friday, Saturday and Monday. M3 (blue) line: on Saturday/19.May replacement buses will operate along the whole line. On Sunday and Monday M3 metro will run between Kőbánya-Kispest termini and Lehel tér all day. Between Lehel tér and Újpest termini replacement buses will carry passengers every day. Grocery stores, shops, food markets (the Great Market Hall) will be CLOSED on 20 – 21. May. Most restaurants, cafes, bars will be open though over the weekend.